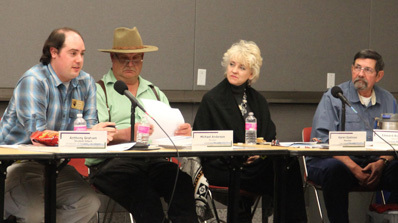 Bill Wilborn (left) and Christine Andres discuss the FFACO strategy decision tree during a January 2017 meeting of the Nevada Site Specific Advisory Board. The Nevada National Security Site (NNSS) groundwater characterization team is off to a running start in 2017. NNSS scientists are making progress in their goal of transitioning all groundwater characterization areas to long-term monitoring according to the strategy outlined by the Federal Facilities Agreement and Consent Order (FFACO) and overseen by the State of Nevada Division of Environmental Protection (NDEP). In January, the Yucca Flat/Climax Mine groundwater area of the NNSS received approval from NDEP to move into the next phase of the regulatory strategy, bringing the area one step closer to this goal. Decades of extensive monitoring and scientific study has shown that groundwater contaminated by historic underground nuclear testing at the NNSS is not a health risk to nearby communities or the public water supply. NNSS scientists use a broad spectrum of information gained through analysis of geologic and groundwater samples to understand the extent of contamination and to ensure public safety for generations to come. At the Yucca Flat/Climax Mine groundwater characterization area (referred to as a Corrective Action Unit in the FFACO document), NNSS scientists have spent more than two decades characterizing the effects of 747 underground nuclear detonations on the area’s groundwater. Since groundwater characterization studies of the area began, more than 30 sampling wells were drilled, developed, and tested, with three new wells drilled in 2016. Scientists use this data, along with data generated from hundreds of other wells drilled during nuclear testing activities, to develop 3-D models of the complex subsurface and groundwater flow system thousands of feet below ground. The computer models are NNSS scientists’ key to gaining insight of the subsurface environment and contaminant migration within groundwater. Models of the Yucca Flat/Climax Mine subsurface are nearing completion, and a scientists now have a clear picture of the area’s geology and groundwater system. They have begun work to test and refine the models in order to produce the most accurate results possible. These efforts led to a successful peer review of the computer models and approval from NDEP to progress to the third phase of the FFACO strategy, called the Corrective Action Decision Document/Corrective Action Plan or CADD/CAP phase within the document. In this phase, monitoring is ongoing as models are refined and a plan for routine, long-term monitoring is developed. 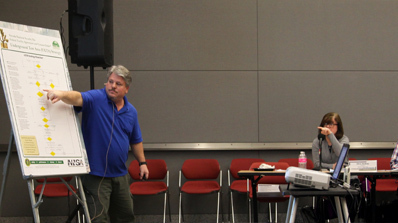 According to Bill Wilborn, DOE Office of Environmental Management, Nevada UGTA Activity Lead, moving into the CADD/CAP phase signifies a good understanding of the area’s subsurface environment as well as confidence that the public is not at risk from the results of historic underground nuclear testing. “We’ve narrowed the uncertainties down to a few specific questions that we can focus on in order to refine our models,” Wilborn said. “Reaching the CADD/CAP phase is a significant achievement for everyone involved. Continued close collaboration with partner agencies will help us achieve the final goal of transitioning Yucca Mountain/Climax Mine to long-term monitoring,” Wilborn said. Eliminating those final few uncertainties will be the goal of the next phase, which when successfully completed and approvals granted, will culminate in closure of investigations and the transition to long-term monitoring into perpetuity. “Under the regulatory framework of the Federal Facility Agreement and Consent Order and oversight by the Nevada Division of Environmental Protection, reaching the milestone of the CADD/CAP Stage for the Yucca Flat/Climax Mine Corrective Action Unit demonstrates the State of Nevada and the Department of Energy’s commitment to work cooperatively on these legacy groundwater issues at the Nevada National Security Site,” said Christine Andres, Chief, Bureau of Federal Facilities, Nevada Division of Environmental Protection. The progress at Yucca Flat/Climax Mine is attributable to the successful collaboration of multiple state and federal agencies, as well as to NNSS scientists dedicated to rigorous scientific investigation. This important work ensures the protection of public health and safety from the effects of underground nuclear testing. Phil Ellingford (left) and Anita Behnke answer these women’s questions at the fair. The Nevada National Security Site (NNSS) is committed to promoting careers in science, technology, engineering and math (STEM). In fact, the NNSS is one of the largest high-tech employers in Southern Nevada. It employs hundreds of scientists and engineers at the Site, 65 outside of Las Vegas as well as the North Las Vegas facility and several other locations in California, New Mexico and Maryland. It should come as no surprise then, that the NNSS places a high value on its outreach in search of both female and minority STEM candidates. At present, all three of the primary mission areas of the NNSS – Defense Experimentation and Stockpile Stewardship, Global Security and Environmental Management – are led by women, a first for the Site. Additionally, recruiters from the NNSS have been aggressively pursuing STEM candidates at job fairs throughout the United States. 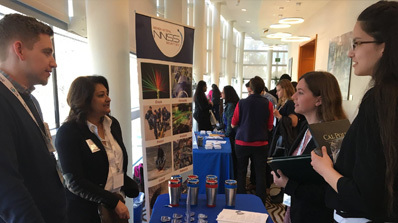 One such fair occurred recently in San Jose, Calif. Women who attended the Society of Women Engineers Job Fair visited booths where they learned first-hand the types of careers available at the NNSS. The first day of the job fair was dedicated to collegiate individuals who were looking for internships; the second day, to engineering professionals looking for jobs. The NNSS recruiters received multiple resumes from attendees, the majority who were interested in upcoming summer internship opportunities in North Las Vegas. The women were encouraged to apply when the internships are posted in March. “It is important for the NNSS to focus on attracting female candidates for our job positions. In a male-dominated industry, a more equal mix of employees diversifies our work force and allows us to gain new perspectives,” said Christina Lora, Human Resources administrative specialist. Currently, there are more than 100 women working for the NNSS who are either managers or scientists/engineers. Of the latter, 27 women are engineers, 37 are scientists and six are technologists. “I enjoy going to job fairs such as this because it is important to reach out to young ladies in STEM-related fields to assure them that they are needed in industry. I also find they are excited to meet female engineers/scientists/technicians who are already in the field,” said Anindita Behnke, supervisor in Livermore Operations' Diagnostic Field Services department. “As the number of American women who are attracted to STEM-related fields continues to dwindle, I think it is especially important to encourage them and show that there are industries who are actively looking for professionals like them to fill science jobs,” Behnke said. Anthony Graham (far left) addresses the NSSAB during a full board meeting in January. According to Anthony Graham, the new intern for the Nevada Site Specific Advisory Board (NSSAB), when some local college students think of the Nevada National Security Site (NNSS), they think of Hollywood movies like Godzilla or Indiana Jones. The NSSAB, a community advisory board, hopes to change these perceptions by increasing awareness and providing involvement opportunities for students at the University of Nevada, Las Vegas (UNLV). The NSSAB has tasked Anthony with introducing UNLV students to the exciting history of the NNSS, in hopes that the truth will be as captivating as a Hollywood blockbuster. Anthony, a PhD candidate in History at UNLV, began his internship with the NSSAB in late 2016. In order to complete the one-year internship, Anthony will be required to log 120 hours of onsite work with the NSSAB; complete several projects, including research projects and a semi-monthly informational digital bulletin; and will attend NSSAB meetings to provide insight on the opinions of the university and youth community in Las Vegas. Anthony will also be asked to present about the NSSAB to the student body to increase awareness of the advisory board within the UNLV community. With this internship, Anthony will serve as the link between the NSSAB and the student body of UNLV. Where are you from? 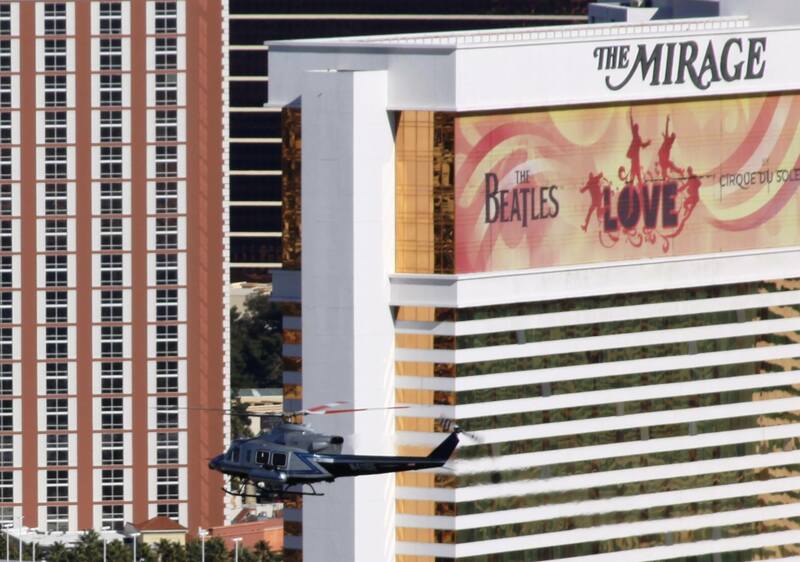 What brought you to Las Vegas? I’m from Pacifica, California, a small coastal city near San Francisco. After receiving a Master of Arts degree from California State University, East Bay, I began looking into doctorate programs across the country. UNLV’s history program interested me because of its professors’ focus on the American West, technology, and the environment. The history program also looks beyond academic history and into the world of public history, including museum work, community outreach, and historic preservation. UNLV’s history program was a perfect fit for me. What drew you to working with the NSSAB? I first heard of the NSSAB from my advisor, Dr. Andrew Kirk. I had been researching public memory and commemoration of atomic testing in southern Nevada, which drew me into studying the NNSS. My interest grew through attending public tours and seeking out locations in Las Vegas with connections to historic nuclear testing. When I heard about the NSSAB it seemed like a natural fit, as it combined environmental concerns, historic preservation, and community outreach. Tell us about your thesis. How does this internship relate to your studies? My thesis focuses on the environmental history of the Mojave and Great Basin deserts in the 20th century and how changing technology shapes both our perceptions of the land and how we interact with it in our daily lives. This internship deals directly with environmental conditions that are the product of land use in the desert. The NSSAB provides input from the community on how best to monitor and clean up the NNSS, which gives us insight on how environmental perceptions have changed since historic nuclear testing took place. How do you plan to get university students more involved with the NSSAB? There are two main challenges to getting university students more involved with the NSSAB. The first factor is the knowledge gap; many do not know about the NSSAB, many of our students do not know about the NNSS or the functions that it serves. Also, much of what they do know about the NNSS comes from Hollywood films. Getting the facts straight can be a long process. The second challenge is to give them the confidence to participate with the NSSAB. The thought of cleaning up after historic nuclear testing can seem like a daunting process, and students tend to be afraid to take risks for fear of looking uninformed. My goal is to inform students about the NSSAB and how it works, so they understand that they can be a valuable part of the process. The newsletter is the first step in reaching out; I will also be visiting classes in different departments to build interest in the program. What was it like touring the NNSS? What was your favorite part? The NNSS is a unique and special place. It is one part science museum, one part wilderness preserve, yet also still very active with the various missions of the Department of Energy. The experience of going to the location in which hundreds of nuclear devices were tested can be both awe-inspiring and other worldly, such as in the case of the Sedan Crater. The remaining structures from nuclear testing delighted the history nerd in me as I quickly recognized the Apple II houses, News Nob, and the bunkers and bank vault at the Priscilla site. Entering Icecap felt like stepping into 1992 and served as a wonderful museum piece. To me the ultimate highlight of any trip to the NNSS is seeing how life has continued to endure and thrive. I have been on three tours and each time we have encountered a herd of antelope at some point. Though environmental damage that resulted from nuclear testing can be seen, for the most part the NNSS is thriving and provides an uplifting image for the future. Meet Anthony and all NSSAB members at the next regular meeting scheduled for Wednesday, March 15, 2017, at the Frank Rogers Auditorium located at 755 E. Flamingo Road, Las Vegas, NV 89119. The NSSAB is comprised of volunteers who represent Nevada stakeholders and provides independent advice, information, and recommendations on U.S. Department of Energy Environmental Management activities at the Nevada National Security Site. For more information, visit http://www.nnss.gov/NSSAB/. Davidson Academy from Reno, Nevada, won first place and a $5,000 check at the 2017 Nevada Science Bowl. After an energetic and exciting competition among 32 high school teams, the Davidson Academy from Reno emerged as champions of the 2017 Nevada Science Bowl. Clark High School from Las Vegas finished second, with Palo Verde High School taking third, and Rancho High School fourth. The top 12 teams received cash prizes for their school’s math/science department. 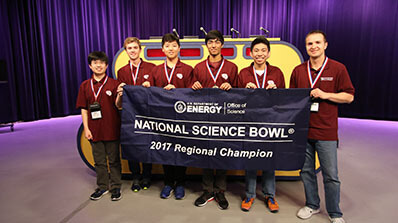 As champions, Davidson Academy received $5,000 and will continue on to represent Nevada at the U.S. Department of Energy’s annual National Science Bowl® in Washington D.C., the largest national science competition. More than 150 of the best students in Nevada practice for months preparing for the Nevada Science Bowl, Nevada’s premiere academic competition. The Nevada Science Bowl features a fast-paced format where students “buzz-in” and answer tough questions covering biology, chemistry, physics, mathematics, astronomy and more. The Nevada Science Bowl encourages and fosters student growth in math and science. Sponsors of the Nevada Science Bowl include: the National Nuclear Security Administration Nevada Field Office, National Security Technologies (NSTec), Northrop Grumman, Centerra Nevada, and Navarro. 9th Place: $100 Legacy High School, North Las Vegas. 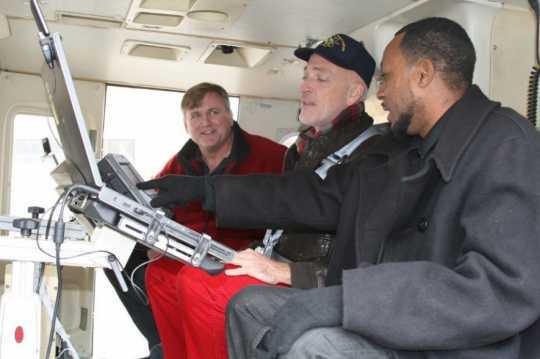 Recently, NNSA Associate Administrator and Deputy Under Secretary for Counterterrorism and Counterproliferation Jay Tilden participated in a scheduled Aerial Measuring System (AMS) proficiency flight. Proficiency flights for each of the missions that AMS conducts are performed by a “response team”—a qualified crew consisting of two pilots, a mission scientist, and an equipment specialist—in order to evaluate roles and responsibilities during a carefully planned scenario. On the recent exercise, Tilden observed how the AMS team brought together mission elements to practice a rapid on-call response. The AMS elements evaluated in this scenario included the aircraft and radiation equipment, radiation science, data management, and communications capabilities, to ensure that the entire team is optimally trained and prepared to respond to a real-world event. Due to the requirements involved in maintaining a mission-ready AMS program, each team member is required to complete a minimum of one proficiency flight per quarter. The response team does all of the planning for these proficiency flights in real time, further simulating a realistic response. 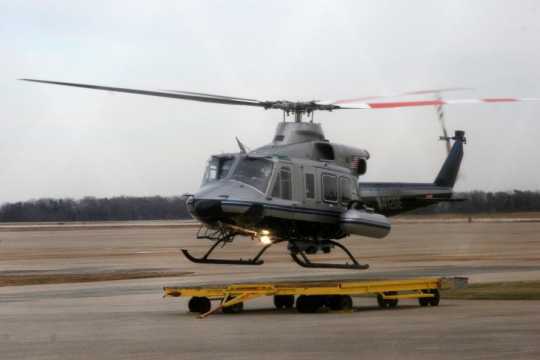 The training activities executed during these proficiency flights provide NNSA leaders and other State and local decision-makers with confidence that AMS will provide necessary support to protect the public and emergency responders during an actual emergency. Read more about the proficiency flight at the National Nuclear Security Administration website https://nnsa.energy.gov.